Every Laurel and Hardy fan that visits Los Angeles wants to climb to the top of the Music Box Steps. They aren’t the best-preserved filming location, but they’re probably the most memorable and instantly recognizable single location used in any of the boys’ films, mostly because they were so integral to the film’s plot. 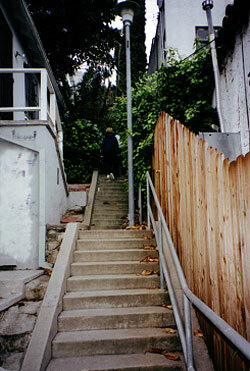 There are many similar stairways on the hillsides of the Silverlake area, but at the time of the movie, there were only a few homes at the top and the bottom of this particular flight of stairs. 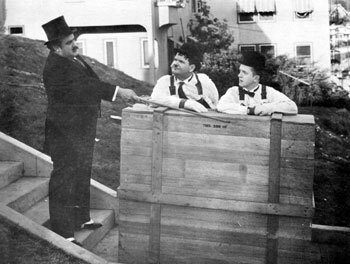 Undoubtedly, one of the reasons they came to this location was because it was easy to place both cameras and crew members on the unbuilt hillside making it easier to film Stan and Ollie dragging the piano crate both up and down the stairs. Today, there are numerous buildings on both sides of the stairs all the way up the hill. For a good portion of the day, the stairs are covered in shadow from the nearby buildings and excessive plant growth. Fences have been built along the sides of the steps, obscuring many of the features that are recognizable from the film. Although the bottom of the stairs are easy to match to pictures or frames from the film, it can sometimes be difficult to match up other facets of this location. When the city put streetlights and a safety railing on the stairs nearly a decade ago, a lot of fans were distraught because it changed the look of the location. But in actuality, they were doing location buffs a great favor. 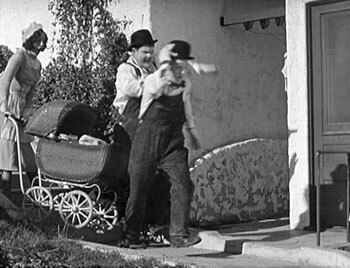 There are two landings prominently featured in the film, the one on which the boys encounter the nursemaid and the other where they have a run-in with Billy Gilbert. It just so happens that the two landings on which they placed the streetlights are the same ones used so prominently in the film. They meet up with the nursemaid on the lower landing with the light, and Billy Gilbert on the higher one. The next time you visit the stairs, remember these landmarks and you will know exactly where to go to take your pictures. Bring your friends and impress them with your ability to take them right to the exact landing where Laurel and Hardy once stood. Then knock their hat off and watch it get crushed by a passing truck. During our visit to these famous steps in May 2007, my mother was eager to shout out the words from the film- especially when they meet Billy Gilbert- MD ADF FLD FFF and F !!! It really was quite surreal to have stood where our two favourite boys filmed all those years ago.